Clad in camouflage and carrying a canteen, Lamont Williams Jr. of Clarkston helps keep the public safe at events around the community. The Clarkston Junior High School student is a cadet senior airman with the Civil Air Patrol’s Oakland Composite Squadron, which provides volunteers to help with crowd control and overnight security. 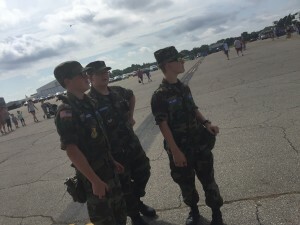 The 13-year-old joined CAP in January 2015 after a visit to an air show at Oakland County Airport. Cadet senior airman is the fourth enlisted rank in the Civil Air Patrol cadet program, and includes instruction in leadership, aerospace, and physical fitness. He earned the Mary Feik Achievement ribbon when he was promoted to that rank. Achievements for which he has been decorated also include recruiter, for signing up two or more cadets, and the General J. F. Curry and General H. H. “Hap” Arnold achievement ribbons. He’s working on his Wright Brothers Achievement award, which is earned along with the Cadet Staff Sergeant rank. 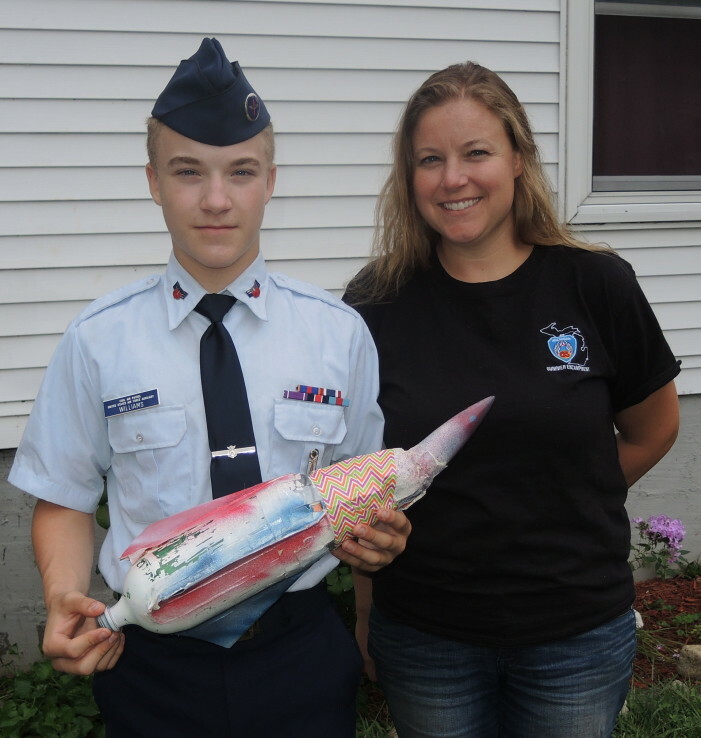 He also earned the Rocketry badge during an encampment in Alpena, learning STEM and aerospace engineering skills. Oakland Composite Squadron meets on Tuesdays at the Oakland County Sheriff’s Office in Pontiac, goes on summer encampments at Alpena Air Force Base, and visits places like the Museum of the U.S. Air Force in Dayton, Ohio. “They get to go behind the scenes, where people don’t usually get to go,” Amy said. They also helped out at Operation Good Cheer, collecting Christmas presents for children in foster care. “We loaded piles of presents for kids onto planes,” Lamont said. He enjoys studying rocketry and hopes to attend a Search and Rescue academy next year at Camp Grayling. Encampments, usually at least a week long, include classes on aerospace education, the United States Air Force, life skills, cadet programs, physical training, leadership development, drill and ceremony, and outdoor activities such as land-navigation competitions. “We won – we had time to build a snowman at every single marker,” Lamont said. “You guys are hilarious,” Amy said. Already learning how to fly, he plans to remain active with CAP as an adult. He’s considering joining the Air Force after high school. If he does, his service with CAP would look very good, he said. “They have a box you can check for that,” he said. He also enjoys swimming and playing the piano.